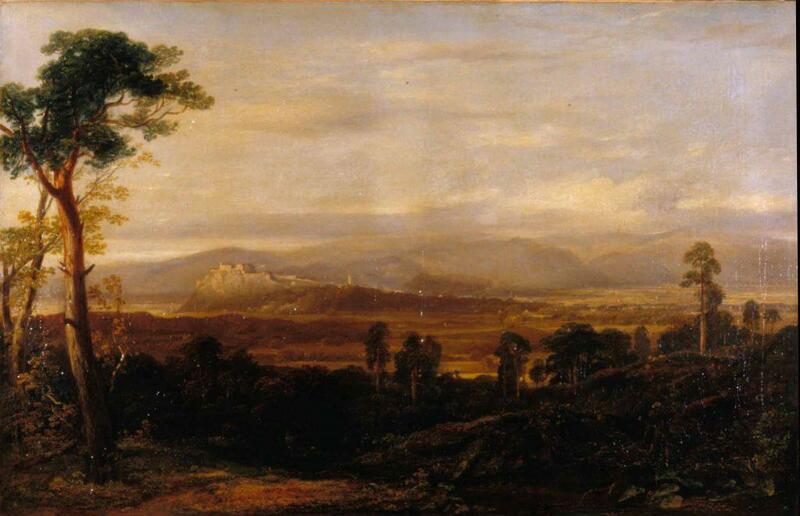 This is one of three works by the eminent Scottish landscape painter Horatio MacCulloch (1805 – 1867) in the Smith collections. The view looks towards the old town of Stirling and the castle on the rock from the hills at Bannockburn. The bottom half of the composition is seen in darkness and the whole is framed by trees. The town and castle are sunlit and appears to shimmer with an ethereal glow set against the misty Ochils and a cloudy sunset sky. MacCulloch was born on the night Glasgow was celebrating Nelson’s victory at Trafalgar, hence his name, and his birthplace in Gallowgate is marked with a plaque. He had some of his early training as an artist, painting snuffboxes in Cumnock, where he met Fintry lad Daniel MacNee, who became as famous for painting portraits as MacCulloch did for landscapes. Both were also taught by the older landscape artist John Knox. MacCulloch also decorated saloon panels for Robert Napier’s steamships around this time. The work is on show in the Painting Stirling exhibition, featuring works of artists from the local to the international. Most of these paintings have not been seen together for many years, so see them at the Smith before exhibition finishes on 29 October.